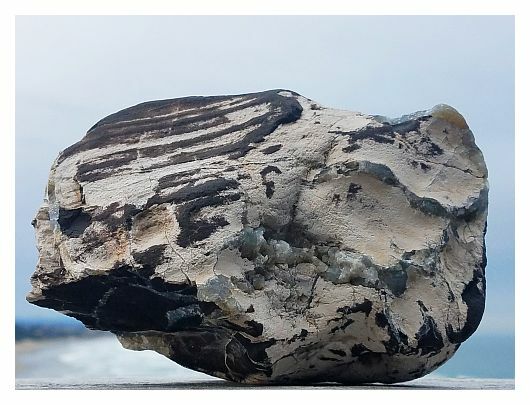 Petrified Wood happens when silicates find their way into a tree's cells and harden there. Over time, the silicates can replace the tree's over all structure and the wood becomes stone. The color of the wood is dictated by the minerals available to tint or muddy the silicates that are filling the structure. This is the Mother Stone that gave birth to the gemstone to the left. The wood was burned before petrifying, leaving it carbon black. This intricate design was created by the silicates filling in the ripples of this burl-wood. 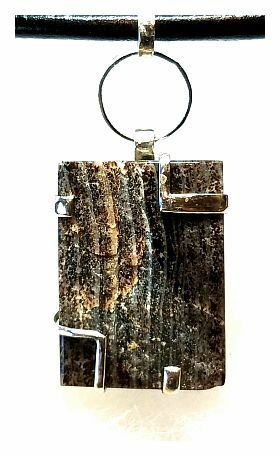 The striations are highlighted with alternating colors of gate and jasper. It's incredible to find wood that seems tropical in nature in the middle of the high deserts of Oregon. Hundreds of species of petrified woods have been identified from times of differing climates. Imagine what this tree saw, the thousands or millions of years old that it is. This piece had druzy quartz crystals growing on top of its grain adding some special natural bling to this gem.